Good morning everyone, Alex here to let you know about a great film summer camp here in Tampa! 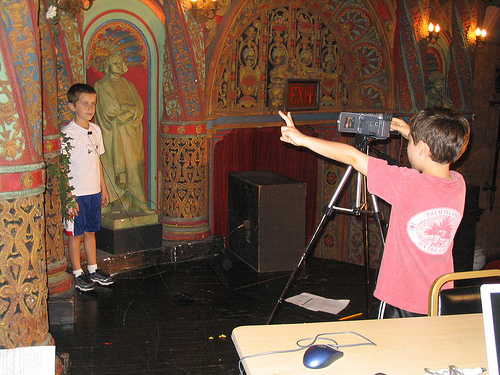 The Tampa Theatre has a film camp where each production team of 3- 5 young filmmakers, guided by a camp counselor, creates a 3-5 minute live action or stop motion animation film. The films are screened at the Tampa Theatre Film Camp Festival and each filmmaker is given a copy on DVD. What a great summer camp for all children. It is the perfect way to stay out of the heat, stay active and learn a little about film making. The camp is a partnership between the historic, ornate movie theater in downtown Tampa and the University of South Florida College Of Education&apos;s Florida Center for Instructional Technology. Unfortunately two more summer film camps have already filled up, but don’t worry there is always next year! If you are interest in enrolling your children in next year’s camp click here and get on the theatre&apos;s email list. Don&apos;t wait too long because the camps fill up quickly! You can also become a theatre member, to get the most up to date camp registration news. Click here, to see the latest artlicle on TBO.com about the Tampa Theatre Film Camp. Enjoy your day and check back with us often for more information on Tampa Bay Film!